The work on the Mumbai project started in 2013, when HCC got in touch with Mosmetrostroy. A joint venture between Mosmetrostroy and Hindustan Construction Company Ltd (HCC) bagged a $372 million (Rs 2,523 crore) contract to construct part of the underground metro line in Mumbai. 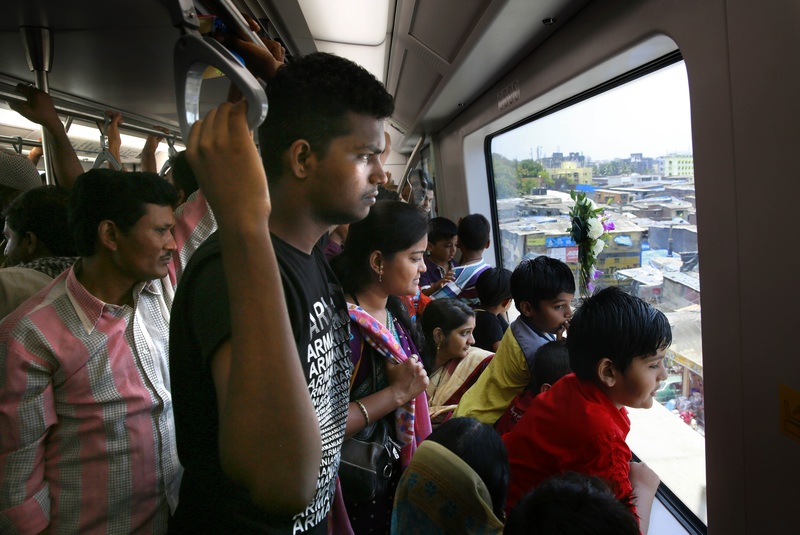 The long-awaited construction on Mumbai’s first underground metro line will begin in a few months with the Mumbai Metro Rail Corporation (MMRC) recently awarding contracts for civil works on various parts of the new 33.5-km long metro line. A consortium led by Hindustan Construction Company Ltd (HCC) in a joint venture with Russian Mosmetrostroy is among the winning bidders. The $372 million (Rs 2,523 crore) contract awarded to the JV between HCC and Mosmetrostroy (HCC has 74% share and the Russian company, 26%) includes construction of a 4,072 metre corridor, four underground stations at Chatrapati Shivaji Terminus, Kalbadevi, Girgaon and Grant Road, and twin bored tunnels of a total length of 3,115 metres The project is to be completed in 55 months. Line 3 of the Mumbai metro, connecting northern and southern parts of the city, will have 26 underground stations and one at ground level, making it the first underground metro in India’s financial capital. The total cost of the Line 3 project is estimated at $2.7 billion (Rs 18,114.9 crore. One crore is equal to 10 million--Ed). Santosh Rai, Head, Transport Sales, HCC, said in an interview with RIR that both HCC and Mosmetrostroy would pull their expertise together as both have experience in constructing metro tunnels and stations. “Our idea for coming together is to share risks of the project. A $400 million project like this is posing large risks because it is not an easy project. When making metro tunnels, you have sewage lines, electric lines, heritage buildings on top, and so on. Then you have to make underground stations, which is another task. So you need somebody who has done it, and Mosmetrostroy has done it in a much more complicated environment than we are talking about,” Rai said. He said people from both companies would work together as a single team within the JV. “We need people who have English speaking capabilities, have worked in international projects. We also may hire people from outside, experts who are known for their expertise in such projects”, Rai added. HCC has a record of cooperating with Russian partners. In 2005, the company executed a turnkey EPC contract for laying a gas transmission pipeline between Kalol and Mehsana in Gujarat state, in a joint venture with the Russian company Nova. HCC also constructed the reactor building and Hydro technical structures at Kudankulam Nuclear Power Plant (KNPP) in cooperation with the Russian state atomic energy corporation Rosatom. HCC claims to have constructed 28 per cent of India's hydel power generation capacity and over 65 per cent of India's nuclear power generation capacities. The company has executed many of India's landmark infrastructure projects, including bridges and highways, and has a record of more than 300 km of complex tunnelling. It also participated in the Delhi Metro and Kolkata Metro projects, as well as in the first phase of Mumbai Metro. Mosmetrostroy, founded in 1931, is one of Russia’s oldest metro construction companies. Over 80 years, the company has built 182 stations and over 300 km of metro lines, more than 30 km of motorways, tunnels and junctions in Moscow city. And, like HCC, Mosmetrostroy has a history of participation in India’s metro projects, albeit a controversial one. In 2011, a consortium of Gammon India Limited and Mosmetrostroy won a bid for construction of underground stations and tunnels in Chennai. The contracts worth $442 million (as per 2011 exchange rate) were part of tender floated by Chennai Metro Rail Limited (CMRL). However, in 2015, Mosmetrostroy suddenly abandoned the project. According to local media reports, following the Russian company’s departure, more than a dozen sub-contractors lodged a complaint against Mosmetro India Limited, the Indian subsidiary of Mosmetrostroy registered in Chennai, alleging that it had failed to pay dues amounting to more than 200 million rupees (around $ 3 million). The CMRL later terminated the contract of Gammon India for their failure to complete work on time, and called for new bids. In June this year, Chennai Metro Rail Limited (CMRL) signed a new contract with Afcons Infrastructure to complete the twin tunnels along the remaining 4 out of the 9km stretch deserted by the Indo-Russian JV. Asked why they terminated the project, a Mosmetrostroy spokesperson told RIR it was impossible to continue to work as per the technical requirements specified in the project documentation by the client, CMRL. “CMRL had not accepted the proposal of Gammon-OJSC Mosmetrostroy JV to change the technology of work in connection with errors in the project. As a result, the dispute is now being resolved in court,” he said, adding that Mosmetrostroy had no plans to continue participating in Chennai project. Multiple sources, on conditions of anonymity, told RIR that the Russian company was tasked to change the alignment of the tunnels well into the middle of the project. This led to a new geological scenario and required new geological studies. Under the new conditions, Mosmetrostory could no longer use same tunnel boring machines it had earlier imported for the project. With the project running into losses while CMRL did not agree to cover the additional costs caused by project changes, the company decided to terminate its work. The Hindu newspaper reported in January this year that CMRL authorities have written to Mumbai Metro Rail Corporation (MMRC) “advising them against awarding the contract for the Mumbai Metro III project to the Russian firm Mosmetrostroy, which had allegedly abandoned the project in Chennai in May 2015”. Despite warning and controversies, the joint venture between HCC and Mosmetrostroy won the bid. Rai from HCC said the work on the Mumbai project started in 2013, when the company got in touch with Mosmetrostroy. “Our major reason for going into a JV with them is that they have done much more complicated metros than this, they were ready to work, invest, bring machines,” Rai says. “On top of that, in 2013, they were still working in Chennai, so we were happy to work with a company that was already established here and knew the local market”. HCC could not comment on this issue citing that what happened in Chennai was unfortunate and is a sub-judice matter between Mosmetrostroy and CMRL. Rai, however, pointed out that when choosing international partners, HCC looks at the strength of an organization. “We chose Mosmetrostroy out of many companies, both in Russia and other countries. This is our first experience with this organization, and we have found it pretty good so far,” he added.